Needs-based motivation theories stem from the understanding that all motivation comes from an individual's desire to fulfill or achieve a need. This also states that human beings are motivated by unsatisfied needs, and typically certain lower needs must be satisfied before higher needs can be satisfied. In general terms, motivation can be defined as the desire to achieve a goal, combined with the energy, determination and opportunity to achieve it. In specific terms to Industrial/Organizational Psychologists, motivation is defined as "Those psychological processes involved with the arousal, direction, intensity, and persistence of voluntary actions that are goal directed" (Mitchell, 1997 as referenced in PSU WC, 2014, L. 1 P. 3). This Wiki explores Abraham H. Maslow's Hierarchy of Needs theory, Clayton P. Alderfer's Existence Related Growth (ERG) Theory, and David McClelland's Need Theory, building off of work by Henry A. Murray. An introduction of the BNT, or basic needs theory, a mini-theory of self determination theory (SDT; Deci and Ryan 1985, 2000), is also included. Abraham Maslow was born April 1, 1908, the first of seven born to his poorly educated Jewish immigrant parents (Hoffman, 2008). Encouraged by his parents to seek academic success, he began studying law at the City College of New York. After transferring briefly to Cornell, Maslow returned to New York before marrying and moving to the University of Wisconsin. While attending UW he began his work in psychology, studying the behaviors of rhesus monkeys with Harry Harlow. His influence at this time was Alfred Alder, and Maslow followed similar veins in his work (Hoffman, 2008). Though the objective was to study attachment and dominance behaviors, Maslow noticed the monkeys’ behavior was driven by different sets of needs. This was the underlining basis for the beginning of his interest in personal need and motivation (Boeree, 2006). It should be said that this early research has been thrown into doubt with more recent primate research in regard to the nature of dominance in monkeys and apes (Cullen, 1997). After earning his Bachelor’s, Master’s, and Ph.D. in psychology, Maslow returned to New York where he began teaching at Brooklyn College. Additionally, he served as the chair of the psychology department at Brandeis University from 1951 to 1969, during which time he became involved with Kurt Goldstein and his theory of self-actualization, which ultimately led to the development of Maslow’s own Hierarchy of Needs theory (Boeree, 1998, 2006). In 1943, Abraham Maslow developed one of the earliest theories of human motivation, commonly referred to as Maslow’s Hierarchy of Needs. In his classic article "A Theory of Human Motivation.” Maslow utilized the term "prepotent" to express the theory that “in the human being who is missing everything in life in an extreme fashion, it is most likely that the major motivation would be the physiological needs rather than any others" (Maslow, 1943, p. 5). Whittington and Evans (2005), referring to that same article, stated that Maslow presented a "prepotent hierarchy in which at least five sets of needs compose the framework" (p.114). The five sets of needs were divided into two categories: basic needs and higher-order needs. The most basic human needs, represented by food, water, shelter, and safety, are considered essential for human existence. Higher-order needs are those associated with social activities, esteem building, and self-actualization or constant self-improvement. Elaborating further on this theory, Whittington and Evans (2005) stated that "each of these needs operates at all times, although one deficient set dominates the individual at any one time and circumstance" (p.114). The motivation experienced by humans to fulfill these needs is either derived from internal or external factors. Intrinsic motivation is found in people who are influenced by factors that cause a sense of accomplishment and pleasure, while extrinsically motivated people are commonly influenced by factors controlled by others, such as money and praise (Deci & Ryan, 1985). Maslow's hierarchy is commonly displayed in a pyramid fashion, with the basic needs at the bottom and the higher needs at the top. The needs were depicted in this way to show the significance of each need on the others, with the most important and broadest category being the physiological needs at the base (Redmond, 2010). 1. Physiological Needs are basic needs that are physiologically necessary for one’s survival, such as oxygen, food, and sleep. These needs must be met before moving to satisfy needs higher in the order. 2. Safety Needs include the desire to feel safe and secure and to ensure that basic physiological needs will remain met. Examples of this need include shelter or housing, physical ability to defend one’s self, the need to have limits or law (or a conscience), and a regular routine that an individual is comfortable with. Once one’s physiological needs have been met, she/he will move on to the safety needs. 3. Social Needs include friendship and companionship. One must know that he/she is not alone in the world and be able to communicate feelings and needs with other individuals. One of the most basic human desires is companionship and a sense of belonging. 4. Esteem Needs - An individual eventually needs to feel that he/she has a social status. This goes beyond just having social relationships; the individual must feel that in work or at home he/she is making a contribution. This also includes recognition of achievement from others. 5. Self-actualization Needs - This is the final and highest level of needs. Meeting this need is characterized by continuously focusing on personal growth, problem solving, life appreciation, and peak experiences for oneself (Huitt, 2004). Maslow’s concept of self-actualization (SA) represents “everything that one is capable of becoming” (Value Based Management.net, 2009). And he felt that the capacity for this concept was innate to all human beings. It was not learned through conditioning or earned through rewards (Hall, 2007). When observing SA, it is important to note that the category does not complete Maslow’s Hierarchy of Needs. Many researchers thought that Maslow believed achieving the SA category would result in the completion of the progression. Researchers found this unattainable because SA is elastic; as one nears their SA, their abilities develop and grow which makes their true potential even greater. However, O'Connor and Yballe (2007) indicate that Maslow intended his theory to be “an ongoing process that involves dozens of little growth choices that entail risk and require courage” (p. 742). Maslow believed that in order for the higher-order needs to be successfully met and not affect basic needs, an individual must first acquire the basic-order needs, referred to as fulfillment progression (Redmond, 2010). 5. Cognitive Needs - Which include the need for knowledge and meaning. 6. Aesthetic Needs - Which encompasses the appreciation of beauty, form, and balance while also activity seeking it. 7. Self-actualization Needs - Moved from level five to level seven. 8. Transcendence Needs - Becomes the final stage and includes the need to help others become self-actualized (McLeod, 2014). Stages 1-4 remain the same. Maslow added cognitive needs as stage five. These include the need for knowledge and meaning. Stage six is known as aesthetic needs. People on this stage appreciate beauty, form, and balance while actively seeking it. Self-actualization needs are stage seven of this theory. The eighth and final stage on the revised hierarchy is transcendence needs. People who have reached this highest stage need to help others become self-actualized (McLeod, 2014). The new hierarchy can be seen below. Maslow’s Needs Theory has remained popular (particularly in an organizational context) regardless of the lack of scientific support. Many of Maslow’s concepts have been entirely refuted or only partially validated (Wahba, Bridwell, 1976). Part of the difficulty lies in the definitions and measurements involved in the studies. Maslow based his theory more on clinical insight as opposed to developing it from rigorous scientific research. There have been attempts to use empirical data to disprove Maslow’s Hierarchy of Needs as a legitimate explanation for the motivation of human behavior (Hunter, Rauschenberger, & Schmitt, 1990). Hunter et al (1990) takes issue with the inability for these theories to be substantiated by statistical analysis of data collected by way of surveys/questionnaires. Some partial evidence exists for the support of the lower order needs, physiological and safety, while the concept of self-actualization suffers from vague definitions and scant empirical evidence (Wahba and Bridwell, 1976). These issues make the theory difficult, if not impossible, to test. Some of the value of Maslow’s Needs hierarchy lies in its intuitive appeal. Regardless of the lack of support, practitioners continue to use the concept of needs satisfaction to motivate and improve individual performance. The case study by Cangemi (2009) demonstrates one instance of how the concept of needs can provide a framework for front line managers to change employee behavior. The managers’ awareness of employee needs and the possibility of these needs changing over time enabled them to modify their management style to improve organizational outcomes. The important thing to remember is that individuals have varying needs and managers can leverage those needs to increase employee motivation. The biggest strength of Maslow’s need theory relates to its intuitive nature. Intuitive nature is the awareness of emotions. It is this strength that supports practitioners in using the theory despite the lack of supportive evidence (O’Connor & Ybatel, 2007). Each person has an individual motivational framework which they work and behave; this framework differs from person to person and even for a single individual from day to day (Redmond, 2010). Practitioners of the theory, those who put it into practice when working within their organizations, understand this flexible, individualized theory as a dynamic solution to motivating members of an organization. Another strength of Maslow's theory is the fact that it focuses on the individual's own constructs and experiences instead of focusing on the mentally ill. Weaknesses, on the other hand, stem from the difficulty of being able to support the theory empirically (Wahba & Bridwell, 1976). Because of the lack of specificity included in Maslow’s theory, it is easily applied in various ways making it difficult to test and study. Moreover, just as norms between individuals fluctuate, so do norms between cultures. Elements like esteem and self-actualization may have vastly different meanings across different cultures making it difficult to standardize Maslow’s theory and the definitions of the components. Maslow's Heirachy of Needs Theory was developed by American theorists and research was done only with Americans. Different cultures often value different needs. In collective societies, or societies in which family members and other in-group members look after each other in exchange for loyalty, belonging is a basic need while self-esteem is less important (Ciani and Gambrel, 2003). Not only do different cultures offer different needs, but so do different generations. This day in age, most Americans have their basic needs met. And even though some are struggling to make ends meet, they are still capable of love and belongingness present in the other level of the hierarchy. Therefore, research supports the notion that Maslow's hierarchy may not accurately represent individual needs in a collective culture. Another weakness to Maslow's theory is the fact that there are exceptions to the theory. For example, what about the firefighters, policemen, and the military, who risk their lives, everyday, to save others. This exception show that there are certain types of people who sacrifice their own basic needs for the welfare of others. It is also possible to achieve self-actualization without having all of your lower needs met, thereby falsifying the theory (McLeod, 2014). For example there are many artists and authors such as Rembrandt and Van Gough that live most of their lives in poverty that could be argued achieved self -actualization (McLeod, 2014). Some believe that Maslow himself saw the weaknesses of his theory later in his life. 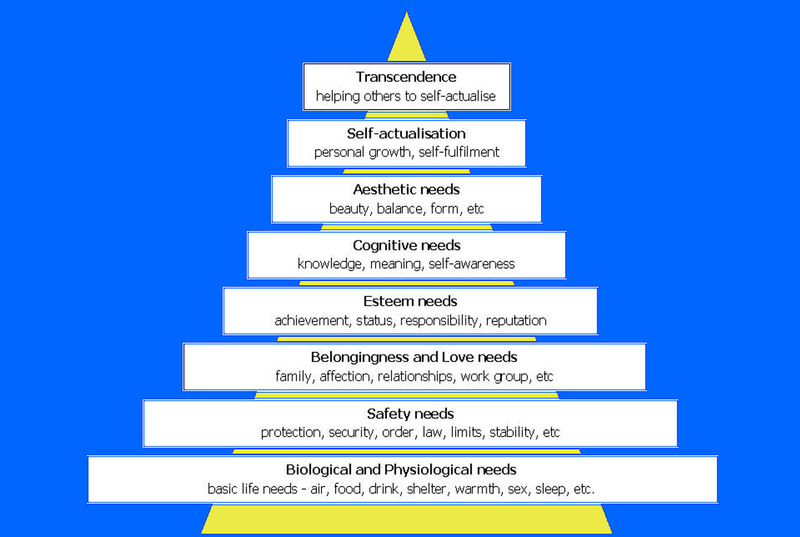 Many believe that Maslow intended to modify his theory by adding a sixth need on top of his pyramid - above self-actualization. This is the need of self-transcendence and would address issues with religion and putting others' safety above one's own. Maslow believed what he called "transcenders" would be highly religious people - regardless of their chosen religion, an indication that he thought of his theory had multi-cultural applications. Regarding cultural differences, he stated, "Culture is definitely and absolutely needed for their actualization; but also culture can fail to actualize them, and indeed this is just what most known cultures actually seem to do and to have done throughout history." (Maslow, Farther Reaches of Human Nature, 326). He believed that transcendence and striving for these types of needs were instinctive to every human. Maslow also believed that transcenders strived for exciting and elaborate situations, called "peaks". The need to reach these peaks could explain why some people perform certain jobs such as policeman or firefighter in which they put their lives at risk for others. "For the transcenders, peak experiences and plateau experiences become the most important things in their lives, the high spots, the validators of life, the most precious aspect of life" (Maslow,Farther Reaches of Human Nature, 283). Maslow's book, Farther Reaches of Human Nature, published after his death, convinced others that he had intended to modify his pyramid. Mark Koltko-Rivera states that "considering the construct of self-transcendence can help us better understand the motivational underpinning of both altruism and religious violence, as well as human wisdom" (Koltko-Rivera, 2006). Many believe that his theory should not only be altered to include this new need, but also that textbooks and other educational sources should be updated as well. Maslow's theory still has implications in the modern day workplace. If a manager or organization understands that lower-level needs must be met before a person can satisfy higher-level needs, the manager or organization is better positioned to meet those needs, and in the order they must be met. Physiological needs can be met by offering a fair competitive wage, lunch/coffee breaks, fitness facilities, and company cafeterias so that the employee feels comfortable that his/her basic needs are satisfied. Next, a company can ensure that the work facility is a safe environment, so that employees feel physically safe. The company can also have a fair progressive discipline policy ensuring job security. Also, the employer can encourage employees to participate on work teams and/or sponsor informal gatherings so employees may socialize to help meet their social needs. A rewards and recognition program for good performance, perfect attendance, and similar programs could help satisfy the employee’s esteem needs. Finally, to help satisfy employees’ self-actualization needs, companies can offer in-house development, or offer reimbursement for tuition or relevant training seminars. There are many possibilities for applying these needs to drive worker's motivation. It may not always be very clear what needs to be done, but this is why it's important for managers to understand these needs theories so that they are better able to apply them when the opportunity arises. As stated by NetMBA, "the manager must be able to recognize the needs level at which the employee is operating, and use those needs as levers of motivation" (2010). This case provides an example of the conceptual model of Maslow’s theory applied to a real situation. The managers at the plant were mostly engineers, accountants, and chemists and had little to no training in human behavior. This model presented them with a blueprint to address the issues of lost productivity and disgruntled workers. The managers now understood the reason behind the employees’ behavior and the actions necessary to change that behavior. This case describes a consultant who presented Maslow’s theory to the management team of a large manufacturing plant. The needs of the labor force had changed over the years and the old management techniques showed little regard for the employees and were causing unrest after 20 years of peace between labor and management. The needs of the older employees, who were largely illiterate or possessed little education, were on a lower level of Maslow’s scale, namely the survival levels of physiological and safety needs. They just wanted a paycheck to survive. A newer generation of workers entered the plant and the strong arm management approach met resistance. New workers had a higher education level and no longer sought satisfaction of their lower level survival needs. The newer generation came to the plant with needs involving recognition, fulfillment, and personal growth, which correspond to the higher level needs of Maslow’s scale. After presenting his findings to the company’s leadership, the situation had improved significantly at the manufacturing facility (Cangemi,2009). A study done by James R. Lindner, a research associate of Ohio State University, about employee ranked motivation factors in correlation with Maslows and others theories of needs and motivation. "Specifically, the study sought to describe the ranked importance of the following ten motivating factors: (1) job security, (2) sympathetic help with personal problems, (3) personal loyalty to employees, (4) interesting work, (5) good working conditions, (6) tactful discipline, (7) good wages, (8) promotions and growth in the organization, (9) feeling of being in on things, and (10) full appreciation of work done. A secondary purpose of the study was to compare the results of this study with the study results from other populations." Twenty-three employees of the twenty-five employees of the company being researched participated in the study. The following needs, in order of high ranking to low ranking, were found to be motivational factors of these workers: interesting work, good wages, full appreciation of work done, job security, good working conditions, promotions and growth in the organization, feeling of being in on things, personal loyalty to employees, tactful discipline, and sympathetic help with personal problems. When comparing these to Maslow's model, it is interesting to see the relationship; interesting work- self-actualizing factor, good wages- physiological factor, full appreciation of work done- esteem factor, job security-safety factor (Lindner, 1998).So this study shows that Maslow's theory and other needs theories can be applied in some situations. “Within the psychological sciences, the pyramid was increasingly viewed as quaint and oldfashioned, and badly in need of updating,” Neuberg added. While Maslow's pyramid has not always been supported by empirical evidence, it does have several ideas worth maintaining. What it lacks are important facts about human nature that were not fully understood during Maslow's time (Kenrick et al., 2010). Self-actualization, while an interesting and important concept, is no longer viewed as an evolutionary, fundamental need and has been removed from the pyramid (Kenrick et al., 2010) Replacing the concept are three evolutionary motives that researchers believe Maslow did not account for; mate acquisition, mate retention, and sitting at the very top is parenting (Kenrick et al., 2010). In the new pyramid, reproduction of our genes is regarded as one of humankind's most biologically fundamental aspirations. This indicates that the notion of self-actualization, when broken down to its most basic form, is actually a subconscious expression of our evolutionary need to reproduce and raise children (Kenrick et al. 2010). In addition to this dramatic change in the top of the hierarchy, researchers have reworked the pyramid to reflect an overlapping of needs. This replaces Maslow's initial idea, that once a need is met it disappears and the individual moves on to the next level (Targeted News Service, 2010). However, Maslow's thought process does not account for the idea that a person who has attained a need, and goes on to the next, may find it necessary to revert back to that need (Kenrick et al., 2010). Kenrick et al. explain that needs developed as people age do not replace earlier needs or more basic needs (2010). Rather, there is an ongoing interplay between internal motivation and environmental situations, whether they are opportunities or threats, which determines which needs will function as a source of individual motivation (Kenrick et al., 2010). While the basic evolutionary premise of this new pyramid has garnered some agreement among researchers, there are still those who do not share the notion that self-actualization should be removed. Along with that, they also do not agree that parenting should receive such prominence at the top of the pyramid. (Targeted News Service, 2010). Kenrick et al. explain their placement of parenting at the top of the modified hierarchy by describing uniquely human characteristics in the rearing of offspring, such as the effort to create and maintain family bonds as well as paternal investment in raising children (2010). 1. Existence Needs: Physiological and safety needs, the most concrete of needs, such as food, shelter, and water. While Maslow’s theory was interpreted as portraying that satisfied needs are no longer a motivation (O’Connor & Yballe, 2007), Alderfer’s ERG theory clearly states that all categories of needs can become more important as they are satisfied. Additionally, individuals may place greater emphasis on any single category as opposed to the rigid hierarchy of moving from one need to the next (Alderfer, 1969). The main difference between Maslow's Needs Hierarchy and Alderfer's ERG Theory is the order in which needs are met. Alderfer believed that needs are met simultaneously and in no specific order, while Maslow's theory states that needs are met one by one and in a specific order (Alleydog, 1998). An example of Alderfer's ERG Theory is a “starving artist,” who may place greater emphasis on creating art (growth) than on existence needs like food or shelter. (Redmond, 2010) An employee who seeks a promotion or increased responsibilities may be attempting to satisfy all needs by increasing pay (existence), developing a larger social network (relatedness), and increasing self-esteem (growth). The following illustration depicts Alderfer’s ERG theory. Notice as one progresses from existence needs through relatedness needs to growth needs, s/he experiences satisfaction. However, regression through the needs levels results in frustration. The idea of frustration-regression is explained as reverting to a lower level need when a higher level need is not met. (Redmond, 2010) Along the same lines, Borkowski (2009) theorized that a person “regresses” to lower needs to once again achieve satisfaction. Alderfer’s ERG needs theory has slightly more research support than Maslow. ERG states that any or all needs can be activated simultaneously. Wanous and Zwany (1977) point out that the validity of the hierarchical structure of ERG theory is supported by research. Few people in their study demonstrated a low or moderate need for relatedness or existence while demonstrating a high need for growth. Furthermore, the authors contend that ERG suggests “moderated relationships between need satisfaction and importance for Relatedness and Growth, but not Existence" (p. 95). Hunter, Rauschenberger, & Schmitt (1990) used a “modified version of Alderfer’s E.R.G. Need Questionnaire” in tandem with a Markov model to study the strength of needs theories. While acknowledging that Alderfer considered his theory to be flexible, the study concluded only minimal support for the theory because of the difficulty in validating the predictions that certain behaviors and needs are interrelated and can be predicted using Alderfer’s own measurement tools. Because the study used these same tools to collect data and the predictions did not come to fruition, the authors concluded dis-confirmation (pg. 669). The need theories have been the focus of much of the research on motivation (Stahl, 1986: 39), because they have been seen as among 'the most enduring ways to understand motivation' (Aram and Piraino, 1978: 79). Need theory suggests that employees are motivated to increase their job performance by their individual striving to satisfy certain needs. Understanding what the needs are and how they are satisfied will enhance insight into work-related behaviors that increase job performance (Stein and Hollowitz, 1992: 20). To this end, the need theory of Alderfer (1967, 1969) has been selected to assess the influence of need satisfaction on job performance of top managers and front-line employees (p. 698). The study wanted to show that when a person's self-esteem is enhanced by fulfilling certain needs, job performance and motivation improve. The results of the study concluded that self esteem does have a great influence on job performance on both managers and front-line employees. The biggest strength of Alderfer’s ERG Theory is the dynamic nature of the theory (Hunter, Rauschenberger, & Schmitt, 1990). The ERG Theory recognizes that people are different and there are variables that can affect the needs of an individual on any given day or any stage of life. The ability to explain a person’s needs on any given day in a way that is measurable using Alderfer’s Need Questionnaire allowing a predictive response from management is an enormous benefit to organizations. The ERG Theory provides a workable solution to addressing the dynamics of human needs that will typically come about within a workplace environment. Alderfer's theory is more flexible and therefore, more in line with the reality of how a person's needs change in reaction to changes that occur in their circumstances. These reactions are very individual and are affected by factors such as education level, temperament, financial standing, or cultural and family backgrounds. A department manager who oversees 70 employees will observe as many as 70 varying reactions when they are informed of a change that is or will be occurring within the organization. These reactions are based on each individual's own perception of how the coming changes will affect their own circumstances, so how they are framed and communicated by top leadership to the workforce is very important. If the organization's leaders take the necessary time to construct a communication strategy that takes into consideration the possible reactions of the workforce by carefully addressing the needs for relatedness and growth, they may be met with less resistance. It's apparent with this realization that the major downside to this theory is the time required by management to gain a thorough understanding of their employees' needs levels and how changes made within the organization can compound with changes going on the employees' personal lives to negatively affect motivation and performance. Unfortunately this flexibility also serves as a weakness in tandem with a lack of research (Hunter, Rauschenberger & Schmitt, 1990). As in any science, critics want to see facts based on research. Minimal research leads to skepticism of the actual worth of the theory. The ERG theory allows individuals to simultaneously satisfy any of the needs; to know this you would have to assess the individual to see what motivated the person to behave a certain way and then determine what need was most important to the person. Measurement of this information may be very difficult to obtain because much time would need to be spent with the subject. Additionally, the freedom for individuals to move among the needs can lead to frustration-regression where needs are not being properly met resulting in a negative move to a lower need with less productivity (Value Based Management.net, 2009).There are, however, exceptions to frustration-regression. According to Brian Redmond, from the Pennsylvania State University, there are two exceptions to frustration-regression. The first exception is "failure to fulfill existence needs leads to greater existence needs" (Redmond, 2010). An example of the first exception is if one needs to sleep and is unable, s/he will develop a larger, more powerful need for sleep. The second exception to frustration-regression is "fulfillment of growth needs leads to greater growth needs" (Redmond, 2010). For instance, if one achieves successful completion of an undergraduate degree program, one may then feel the need to attend graduate school in order to obtain more education and expertise. Despite the difficulty science has had with attempts to either prove or disprove Alderfer's theory, its validity remains intact as more behavioral analysts and people managers recognize and accept that human behaviors are motivated by human needs. In the workplace managers must recognize that an employee has multiple needs to satisfy simultaneously. According to the ERG Theory, focusing exclusively on one need at a time will not effectively motivate employees to do their job. The ERG Theory acknowledges that if a higher level need remains unfulfilled the person may regress to lower level needs that they can more easily satisfy. This frustrates employees and impacts workplace motivation until the higher need can be fulfilled. It is important to realize that there are differences between Maslow's theory and Alderfer's ERG Theory. One of the main differences is that the ERG Theory states that an individual needs to satisfy several motivators at the same time; therefore, an employer who only tries to satisfy one need at a time will not be effective in motivating their employees. In addition, needs do not have to be filled in any particular order. ERG theory allows for movement back and forth from one need to another (PSWC, 2013). Another important aspect of the ERG theory to look at in a management position is the frustration-regression principle. This principle explains that without opportunities to advance, employees may regress and end up satisfying other needs, like socializing with co-workers. It is important for those in leadership positions to realize the possibility of regression and provide room for growth and socialization with their employees (Envision Software Incorporated, 2007). In a case study that was done in a real estate organization, the ERG Theory was upheld and reinforced when the employees were unable to attain the higher level needs and as a result they regressed to the lower level needs to attain fulfillment. In this study, the real estate organization hired new finance managers with the hope that they could replace the managers that had been in these positions who were not performing satisfactorily. The new finance managers were satisfied with the existence needs (salary and working conditions) and within a short time were satisfied with relatedness needs (rapport within the departments and management). Within six months of employment the finance managers became frustrated due to upper management not trusting them to complete a task without supervision. As a result of this the finance managers regressed back to lower level needs and asked management for new titles and larger offices. Management granted the request to appease the finance managers as they had been complaining to upper management. While the existence and relatedness needs of the Finance Mangers were met, they could not achieve their growth needs so they placed more emphasis on the lower level needs (Buhler, 1988). David McClelland, born May 20, 1917, earned his doctorate at Yale University in 1941. He became a major contributor to the study of human personality and motivation in both education and industry. McClelland contributed to education through his instruction at Wesleyan University, Harvard, and Boston University. He contributed to industry through McBer, the consulting agency which he started in 1963 and which helps managers to assess and train employees. McClelland is best known for his work on achievement motivation models and their practical applications, namely the Thematic Apperception Test and Need Theory. (Chapman, 2009). McClelland focused on operant methods of behavioral testing, claiming greater validity when tests generated thoughts or actions. McClelland offered many publications to his field, including The Achievement Motive (1953), and The Achieving Society (1961). McClelland pioneered motivational workplace thinking, and remained concerned with opening opportunities for self development and applying motivational principles pursing life's goals (McClelland, 1978). In his 1961 book, The Achieving Society, David McClelland identified three types of motivational needs, on which he based a model to describe one’s style with regard to being motivated and motivating others, depending on the different level of needs within the individual. There are a few distinct characteristics possessed by individuals with each need. Henry A. Murray (1983-1988), a psychologist, whom Mcclelland was a student of, identified about 20 human needs, and believed a close relationship existed between motivation and personalitiy. Although only three of Murray's original identified human needs continue to be studied, McClelland derived his theory from the three remaining needs; for achievement, for power, and for affiliation. Authority/Power Motivation (nPOW) - Individuals with a need for authority and power desire to influence others, but do not demonstrate a need to simply have control. These individuals possess motivation and the need to increase personal status and prestige. Affiliation Motivation (nAFF) - Finally, those with a need for affiliation value building strong relationships, admire belonging to groups or organizations, and are sensitive to the needs of others. (Stuart-Kotze, 2009) This type of person is a team player and wants to be respected and liked. According to McClelland, most people possess and portray a mixture of these characteristics. Some people display a strong bias toward a particular motivational need which, in return, influences their behavior and influences their working/management style. McClelland believed that those who resembled the "affiliation motivation model" had diminished objectivity as a manager. He attributed this weakness to their need to be accepted and liked, which can impair decision making. A person who fits the "authority motivation model" is more devoted to an organization, and also possesses a better work ethic. Those who seek power within a leadership role may not even know how to get along with others and how to compromise. Lastly, individuals who fit the "achievement model" are more likely to be overachieving and overbearing (Accel-team.com, 2010). These types of people prefer tasks that are challenging and also prefer to work alone. McClelland also believed that an individual's need grouping changes as they grow, and those who do not naturally possess specific needs can acquire them through training and experience (Mendenhall, Punnett & Ricks, 1995). McClelland demonstrated that by providing training to a group of businessmen in India, promoting greater nAch, would in turn, promote greater economic development (McClelland 1961). Follow-up studies two years later, evaluating economic development between the group trained to have higher nAch and those that did not receive the training, confirmed his belief. McClelland used the Thematic Apperception Test (TAT) to measure motivation under the impression that motivation was a more efficient predictor of achievement than intelligence. In the TAT, subjects are shown pictures of ambiguous scenes and asked to create a story based on the pictures. The theory on the TAT is that the content of the subject's story will reveal the individual’s needs, attitudes, and behavioral patterns. The TAT was developed during the 1930s by American psychologists Henry Murray and Christiana D. Morgan at Harvard while exploring the underlying force of personality. Such forces included internal conflicts, dominant drives, interests, and motives. McClelland and his associate created a scoring system to measure an individual’s score for each motivational model. The score assigned can infer the types of jobs the person is best suited for. The validity of TAT is suspect, however, as questions have been brought forth regarding test scoring as well as TAT's true ability to discern needs (PSU World Campus, Psych484, Lesson 2, 2012). When studied by other researchers, Mclelland’s theory has found support, with an emphasis on the need for achievement. For example, a meta-analysis performed by Stewart and Roth (2007) found that entrepreneurs typically had higher needs for achievement than did managers. The autonomy and challenging demands of entrepreneurship are conducive to satisfaction of this need. In addition, Park, Lee, and Kabst (2008) demonstrate that achievement, affiliation, and power needs are important predictors in organizational commitment (OC) and job involvement (JI). Those with strong achievement needs demonstrate higher levels of performance and are more goal-oriented. While both average and above average employees exhibit similar needs profiles, the need for achievement is higher for those with higher OC and JI. Value can be found in Mclelland’s theory but determining the levels of individual needs and subsequently matching those needs to a job situation presents a challenge for practitioners. David McClelland’s theory is regarded as more useful than those of Maslow and Alderfer (McClelland, 1965). This is because there is much more empirical evidence to support McClelland's Needs Theory than Maslow's or Alderfer's. Unlike the previous theories, McClelland believed that needs were not innate but learned at a young age and could also be developed in individuals. McClelland developed training programs for managers to increase their need for achievement. This need correlates well with positive organizational behaviors and performance. While other needs theories are more descriptive, McClelland offers a better mix of description and prescription enabling organizations to proactively encourage beneficial corporate behavior through both training programs and matching motivational needs with job situations. However, critics of McClelland's theory state that there are issues with the validity concerning the TAT projection used to determine the level of individual needs (Redmond, 2009). McClelland’s theory is criticized for its lack of predictive power as it relates to entrepreneurship. The decision to own or manage a business is not directly correlated with the need for achievement as there are many factors that drive people to become entrepreneurs (Kapp, Smith-Hunter, & Yonkers, 2003). Also, differences in cultures play a significant role in how achievement is viewed. Some cultures view failure as a learning experience that allows the opportunity to grow and become stronger in areas that caused the setback, while other cultures focus on the regressive side of failing to achieve. By understanding and being able to effectively measure need for affiliation (nAff), need for power (nPow), and need for achievement (nAch) characteristics in employees, employers have the opportunity to make better decisions of which type of employees to put in various positions. For instance, since people with a high need for achievement have a high need for personal improvement and success, an employee with a high nAch may not be best suited for a receptionist position without any opportunity for advancement or growth. Conversely, someone with a high nAff might be the perfect person for a receptionist position. McClelland’s Need Theory suggests that understanding these needs and accurately placing the right people in the right positions should yield greater levels of motivation which, in turn, should increase productivity and reduce turnover. When it comes to management, McClelland's theory can prove to be very beneficial. It is important to realize that people are motivated differently. Some individuals have a high need for achievement and should be given difficult and challenging projects. Employees with a need for high achievement should be given frequent feedback. Individuals with a high need for affiliation need to work in a cooperative environment. They enjoy working in groups or teams and will be very productive in those circumstances. Those who have a need for power should be given the opportunity to manage others. In group projects the management should deem them the leader of the group, especially with those who have a need for affiliation. This presents a great situation that allows for two types of people to be motivated and to work together while each accomplishing their goals and fulfilling individual needs (NetMBA.com, 2007). McClelland has a high interest in those with the nACH. He finds that people with this high need for achievement fascinating. McClelland had experimented with people to see who belonged to which group and to what degree they may possess more than one. The experiment involved throwing little rings and trying to wrap the little ring around a peg. These games are typically seen in festivals or carnivals. He noticed that those that had the nACH were very much different from the others. McClelland says that those with the nACH were less worried about making it easy like the others. They didn't try to find the easiest way by standing closer or leaning foward as far as they could just so there was an advantage. He explains that the nACH would try to make the game even more challenging by standing further away or coming at it at more difficult angles. McClelland believes there is something else going on other than just setting goals and completing them. Some high nACH individuals need to apply more challenge to their lives and every time a challenge is met successfully they need a stronger more challenging task. He calls this the "balanced challenge" and it is use to keep the person in good shape mentally. (Chapman, 2009) This shows why it is a good idea to know what needs a person has to properly motivate them in the right manner and to expect that not all employees are motivated by challenge. For those where nACH is high, needs are met when these individuals meet their own goal, regardless of other's performance or situation. For these individuals, well being (happiness, joy, contentment) is tied directly to the meeting of those goals. The desire to perform at a high level (higher than peers) is present in in indivudals who rate high in nACH. This may lead these individuals to seek vocations that require high levels of skill and difficult challenges, this includes vocations that have responsibility and problem solving as core tasks. (Royle & Hall, 2012). Basic Needs Theory (BNT) is an offshoot of the Self-Determination Theory (SDT), which investigates the connection between human developmental tendencies and innate psychological needs that drive motivation and personality (Deci & Ryan, 2000). More specifically, BNT suggests that “humans function and develop effectively as a consequence of the social environment and its potential for basic need satisfaction” (Adie, Duda & Ntoumanis, 2008, p. 189). Autonomy – The need of an individual to make his/her own decisions and choices. Competence – The need of an individual to feel a sense of mastery and/or success while interacting with his/her environment. Relatedness – The need of an individual to feel connected to, and respected by, significant others. According to Ryan and Deci (2000), these basic needs are energizing; when they are fulfilled, they result in a sense of well-being. When these basic needs are not satisfied, they result in illness and a sense of ill-being. In relation to the three basic needs identified above, research suggests that conditions supportive of autonomy and competence facilitated growth and development, while conditions that sought to control behavior undermined motivation (Ryan & Deci, 2000). Furthermore, excessive control, a lack of challenging tasks, and a lack of relationships not only results in lowered motivation but also emotional distress and psychopathology (Ryan & Deci, 2000). The findings above have great implications for not only I/O psychology and consultation, but from schooling to athletics and beyond. The video below describes one aspect of BNT’s application, performance, motivation, and well-being in youth sports. Accel-team.com. (2010). Human Relations Contributors: David McClelland. Retrieved from http://www.accel-team.com/human_relations/hrels_06_mcclelland.html. Adie, Duda, and Ntoumanis (2008) Autonomy support, basic need satisfaction and the optimal functioning of adult male and female sport participants: A test of basic needs theory. Motivation & Emotion, 32, 189-199. Arnolds, C.A. & Boshoff, C. (2002). Compensation, esteem valence and job performance: an empirical assessment of Alderfer's ERG theory. Int. J. of Human Resource Management, 13(4), 697-719. B2B Whiteboard. (Producer). (2013, January 3). ERG Theory - explained [Web Video]. Retrieved from http://www.youtube.com/watch?v=kvhr2H5rAgY. Baran, B. (Performer). (2012, January 18). Employee Motivation: Need Theory [Web Video]. Retrieved from http://www.youtube.com/watch?feature=player_embedded&v=CfEKT6E8V7c. Cangemi, J. (2009). Analysis of an Adversarial Labor/Management Situation in a Latin American Industrial Setting: A Case Study using Maslow's Hierarchy of Needs. Organization Development Journal, 27(1), 37-47. Retrieved September 1, 2009, from ABI/INFORM Global. (Document ID: 1655857271). Cullen, D. (1997). Maslow, Monkeys and Motivation Theory. Organization, 355-373. Deci, E. L., & Ryan, R. M. (2000). Self-determination theory and the facilitation of intrinsic motivation, social development, and well-being. American Psychologist, (55.1). 68-78. DuBrin, A.J. (2004). Applying Psychology: Individual & Organizational Effectiveness. New Jersey: Pearson. Gambrel, P.A. & Cianci, R.. (2003). Maslow's Hierarchy of Needs: Does It Apply In A Collectivist Culture. Journal of Applied Management and Entrepreneurship, 8(2), 143-161. Retrieved September 8, 2009, from ABI/INFORM Global. (Document ID: 1178660531). Hill, C. W., & McShane, S. L. (2008). Principles of Management. New York, NY: McGraw Hill. Hoffman, E. (Performer). (2009, September 17). Dr Edward Hoffman Lectures on Maslow [Web Video]. Retrieved from http://www.youtube.com/watch?v=wVJwgMOCrLwfeature=player_embedded&v=CfEKT6E8V7c. Hoffman, E. (2008). Abraham Maslow: A Biographer's Reflections. Journal of Humanistic Psychology, 48, 439-443. Hunter, J., Rauschenberger, J., & Schmitt, N. (Dec 1990). A Test of the Need Hierarchy Concept by a Markov Model of Change in Need Strength. Administrative Science Quarterly, Vol. 25, No. 4, pp. 654-670. Johnson Graduate School of Management, Cornell University. Retrieved January 21, 2010, from http://www.jstor.org/stable/2392286 . Johnson, G. (Performer). (2011, September 26). 2.2.9 Life Coaching Course; Cognitive Theory of Motivation [Web Video]. Retrieved from http://www.youtube.com/watch?v=afPPF8c3Lbw. Kapp, J., Smith-Hunter, A., & Yonkers, V. (April, 2003). A Psychological Model of Entrepreneurial Behavior. Journal of the Academy of Business and Economics. Retrieved From http://findarticles.com/p/articles/mi_m0OGT/is_2_2/ai_113563670/?tag=content;col1. Kenrick, D.T., Griskevicious, V., Neuberg, S.L., & Schaller, M. (2010). Renovating the pyramid of needs; contemporary extension built upon ancient foundations. Perspectivesof Psychological Science, 5(3), 292-314. Koltko-Rivera, Mark E. (2006). Rediscovering the Later Version of Maslow's Hierarchy of Needs: Self-Transcendence and Opportunities for Theory, Research, and Unification. Review of General Psychology, 10(4), 302-17. Lahey, B.B. (2001). Psychology an introduction. Boston: McGraw. Maslow, A. (1943). A Theory of Human Motivation. Psychological Review, 50, 5. Maslow, A (1971). Farther Reaches of Human Nature. New York, 1971.283, 326. McClelland, D.C. (1965). Toward a theory of motive acquisition. American Psychologist, 20, 321-333. Mendenhall, M. E., Punnett, B. J., & Ricks, D. A. (1995). Global Management. Cambridge: Blackwell. Nauert, R. (2010, August 23). Updated maslow’s pyramid of needs. PsychCentral, Retrieved from http://psychcentral.com/news/2010/08/23/updated-maslows-pyramid-of-needs/17144.html. O'Connor, D., & Yballe, L.. (2007). Maslow Revisited: Construction a Road Map of Human Nature. Journal of Management Education, 31(6), 738-756. Retrieved January 21, 2010, from ABI/INFORM Global. (Document ID: 1392302941). Padilla, A., Hogan, R., & Kaiser, R. (2007). The Toxic Triangle: Destructive Leaders, Susceptible Followers, and Conducive Environments. The Leadership Quarterly, 18, 176-194. Park, Y., Lee, C., & Kabst, R.. (2008). Human Needs as Predictors for Organizational Commitment and Job Involvement: An Exploratory Empirical Study**. Management Revue, 19(3), 229-246. Retrieved September 3, 2009, from ABI/INFORM Global. (Document ID: 1615081831). Pennsylvania State University World Campus. (2012). Psychology 484, Lesson 2: Needs Theories. Royle, M., & Hall, A. (2012). The Relationship Between McClelland's Theory of Needs, Feeling Individually Accountable, and Informal Accountability for Others. International Journal of Management and Marketing Research, 5., 21-44. Redmond, B.F. (2010). Need Theories: What Do I Want When I Work? Work Attitudes and Motivation. The Pennsylvania State University World Campus. Stewart, W., & Roth, P.. (2007). A Meta-Analysis of Achievement Motivation Differences between Entrepreneurs and Managers*. Journal of Small Business Management, 45(4), 401-421. Retrieved September 2, 2009, from ABI/INFORM Global. (Document ID: 1378966581). Stuart-Kotze, R. (2009). Motivation Theory. Retrieved from http://www.goal-setting-guide.com/motivation-theory.html. Whittington, J.L. & Evans, B. (2005). The Enduring Impact of Great Ideas Electronic Version. Problems and Perspectives in Management, 2, 114. Wanous, J. P., & Zwany, A. (1977). A cross-sectional test of the need hierarchy. Organizational Behavior and Human Performance, 18, 78-97.